Happy New Year, dear readers! May 2019 bring you joy, laughter, friendship, beauty and meaningful work, wherever you are and whatever you do! And when the bad stuff happens (as it always does), may you find strength, peace and the support you need, in yourself and in those around you. Many of you are aware I've been keeping a daily tapestry diary for three years now. It's been a piece that varies in shape, theme and purpose each year, but the constant is that I try to weave a little bit every day that somehow reflects my life and the world around me. 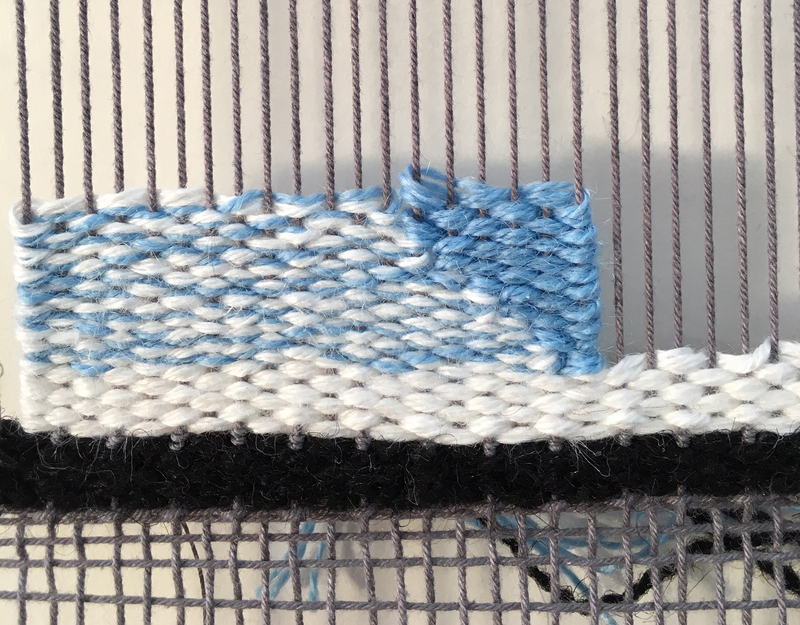 My hope is to continually refine my weaving skills and to weave every day, even if only for ten minutes. You can see images of past diaries HERE and HERE and HERE. I've been debating with myself whether and how to continue the practice in 2019, and many of you were kind enough to weigh in on my public musings on social media last month (see Dec. 10 posts @mollyelkind on Instagram and on Facebook as Molly Elkind and Molly Elkind Handwovens). Since the beginning of this new year is very busy for me, I chose a structure for the 2019 diary that I hope will refine my technical skills while not requiring a lot of creative thought each day. 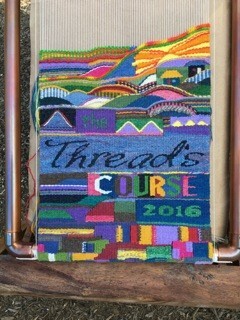 I will be working my way through Mette Lise Rossing's book The Thread's Course in Tapestry. This fantastic book is a wonderful primer of tapestry technique AND includes a tantalizing section on tapestry techniques as expressed in various cultures. I'm excited that I will learn many techniques new to me (and practicing familiar ones as well), such as various kinds of joins, soumaks, twining, and finishes. 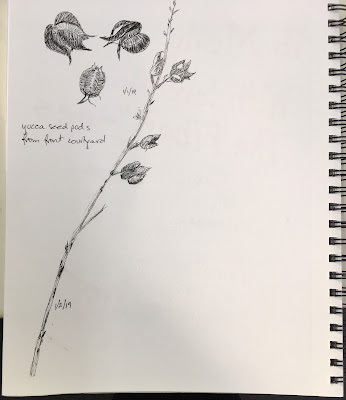 A huge thank-you to Mavis Adam (@mdadam on Instagram) for inspiring me with her own spectacular diary based on The Thread's Course. I love Mavis's choice of colors and how beautifully she wove the title of the book. Here's two days' worth of my new tapestry diary. The white band is the first technique in the book, simple plain weave, an appropriate foundation for all the techniques to follow. 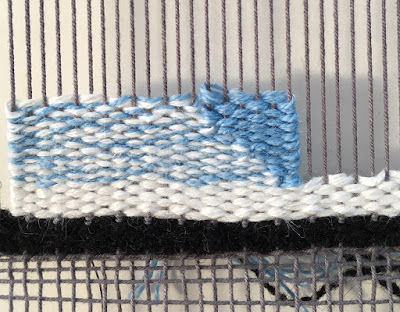 The blue and white section illustrates the second technique, a diagonal line made when you turn on 2 low warps and 1 high warp. I filled in the angle with solid blue so I could start tomorrow's shape with a straight edge. I don't expect it to take me the entire year to work through The Thread's Course, so the plan is that when I finish (and my calendar has opened up a bit), I will use my newfound skills to undertake some small studies based on historic tapestries from around the world, Coptic and Peruvian and Norwegian and medieval French and so on up into the 20th and 21st centuries. It might be that these studies will take me well into 2020, God willing and the creek don't rise! This project really excites the art history geek in me, and I can't wait to start planning the first piece. I have also decided to undertake a drawing practice, as close to daily as I can make it. I have fallen in love with Lara Gastinger's perpetual journal work on Instagram (@laragastinger; #lgperpetualjournal). Earlier this year I made time to draw some broken-down barbed-wire fences in our neighborhood, for 15 or 30 minutes almost every day for a few weeks. It gave me so much joy! I loved both the process and the way it slows me down (I guess tapestry doesn't slow me down enough!). I find that drawing forces me to be more observant, and I notice over and over again that I do improve a little bit when I practice regularly. Duh. 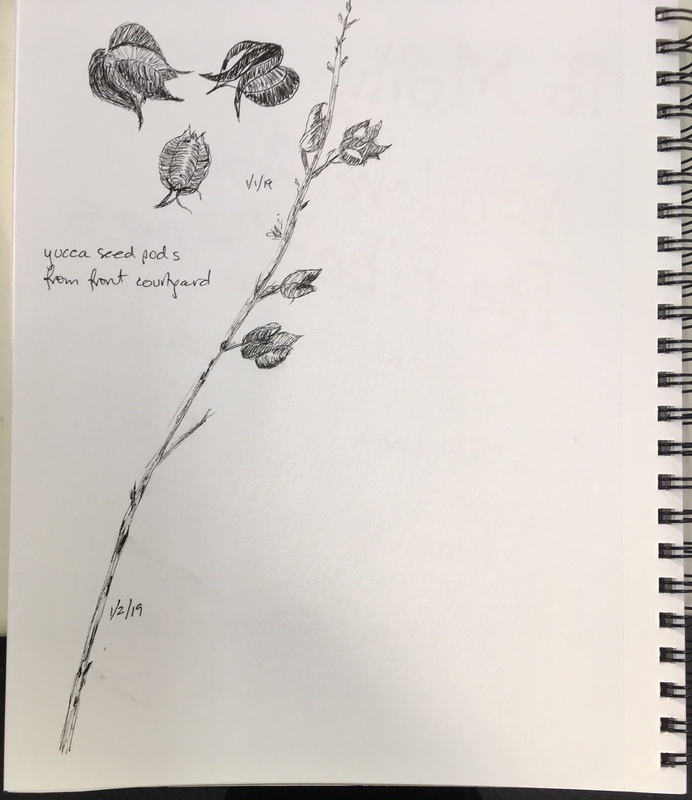 A perpetual journal of ink and maybe watercolor botanical sketches seems like a perfect way to both improve my drawing skills (which need improvement) and to get better acquainted with the plant life in my corner of New Mexico. I'd love to hear if any of you have adopted a new daily creative practice this year, or are planning to continue old ones. My best wishes to you all in all your creative endeavors, whether specifically "artistic" or not! We are all the artists of our lives every day, right?